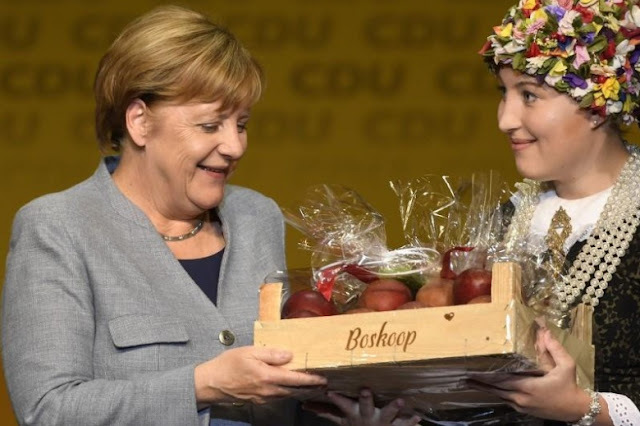 German Chancellor Angela Merkel receives a gift during a Lower Saxony's Christian Democratic Union's (CDU) regional election campaign rally in Stade, Germany October13, 2017. BERLIN - The German state of Lower Saxony voted on Sunday in an election likely to hand the Social Democrats (SPD) a narrow victory and deny Chancellor Angela Merkel’s conservatives a boost in looming national coalition talks. Disgruntled with Merkel’s liberal migrant policy, Germans abandoned her party in droves in September’s national election. Having recorded the worst conservative result since 1949, she must now try to piece together an awkward alliance with the pro-business Free Democrats (FDP) and environmentalist Greens. Those parties will this week begin discussions that could drag into 2018 about entering a marriage of convenience untested at the federal level. The latest opinion poll put the SPD on 34.5 percent in the northern swing state of Lower Saxony, giving it a 1.5 point lead over Merkel’s Christian Democrats (CDU) who had been 12 points ahead at the start of the campaign in August. Exit polls from the rich agricultural state with around six million eligible voters are expected at 1600 GMT. At 1030 GMT around 27 percent of voters had cast their ballots at the end of a campaign that focused on regional issues such as education. Simon Fink, political scientist at the University of Goettingen, said no one had dared to start coalition negotiations in Berlin ahead of the election in Lower Saxony, which is slightly bigger than the Netherlands and hosts major companies such as carmaker Volkswagen. “Everyone was scared that if they did something at the national level or committed themselves to something, then their colleagues in Lower Saxony could end up suffering,” he said. Merkel’s reverse in September, along with the SPD’s insistence on going into opposition, left her with no viable option other than a “Jamaica” coalition, so named because the three parties’ colors correspond with the black, yellow and green of Jamaica’s flag. It means the prospective partners will need to overcome yawning differences on issues ranging from immigration to European Union reform, tax and environmental protection. Cem Ozdemir, co-leader of the Greens, said the three parties had not sought each other out but now had a responsibility to form a coalition that bore the hallmarks of their conservative, liberal and center-left identities. “If the coalition comes off, it must not be a coalition that only agrees on the lowest common denominator. That won’t work,” he told Welt am Sonntag newspaper, adding that the trio needed a “shared narrative”. A deal brokered last weekend between Merkel’s CDU and its conservative Bavarian sister party, the CSU, to cap the number of immigrants is likely to be hard for the Greens to swallow. Merkel has acknowledged the difficulties ahead but added that “unusual combinations can of course bring the opportunity to find some solutions to things that had seemed unsolvable until now”. “So now we need to put our noses to the grindstone,” she said on the campaign trail in Lower Saxony on Thursday. An SPD-Green coalition has ruled the state for four years, but lost its majority when a Greens lawmaker defected to the CDU, triggering a snap election. The SPD’s incumbent state premier, Stephan Weil, a 58-year-old former judge, fares better in the personal popularity stakes than his CDU rival Bernd Althusmann, a 50-year-old former army officer. The German state of Lower Saxony voted on Sunday in an election likely to hand the Social Democrats (SPD) a narrow victory and deny Chancellor Angela Merkel’s conservatives a boost in looming national coalition talks.